Pad thai is a favorite of mine. I am sure at some point I’ve told the story about the old YMCA on the University of Illinois campus (right by the quad & Chi Omega house, for those familiar) and the Thai food they served there for lunch. Sometimes around noon I’ll get a text from my sister-in-law (a senior at U of I) that she just had YMCA pad thai. I get so jealous every time…it is so good. Of course I’ve come up with nothing near as good, but my quest continues. 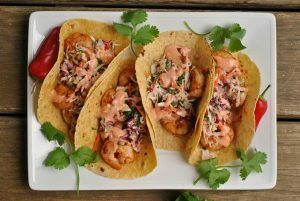 When I saw this recipe from Cooking Light, I gave it serious consideration before adding it to our menu. Ketchup in pad thai? Reeeally? How non-authentic can one recipe get? But then I thought back to previous pad thai attempts and reader comments on rare or hard-to-fine ingredients. Admittedly, I drove miles to find tamarind paste for the last pad thai recipe I tried. So being the practical reader-pleaser that I am, I gave this recipe a whirl. Ends up, it was really good! Fish sauce and Sriracha can be found in any grocer – just check out the Asian/ethnic foods aisle. Flat rice noodles are also easy to find. A Taste of Thai is a popular brand I’ve found a lot of luck with. All of the other ingredients are simple, cheap, and can be found anywhere. 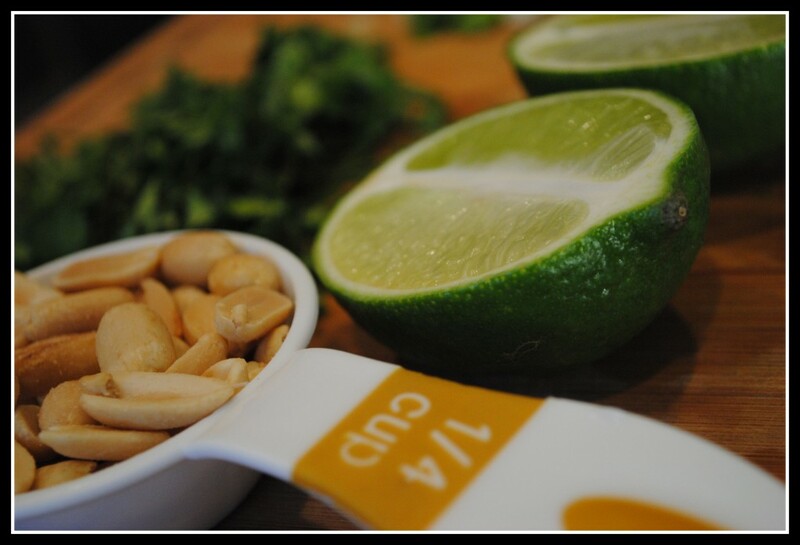 If you’ve never had pad thai or made pad thai, this would be a great beginner recipe. I do plan to tweak the recipe some (now that I have tamarind paste, I think I should probably use it!) to make it more authentic, but we thoroughly enjoyed this recipe. I even lightened it up a bit more by baking the tofu and omitting all of the oil. I then declared this recipe for for 3 versus 4. Portion control is tough with something like pad thai…you’ll see! Place tofu on several layers of paper towels; cover with additional paper towels. Press down firmly to remove water. Cut tofu into 1/2-inch cubes, and layer on a baking sheet or 9 x 13 pan, coated in cooking spray. Spray tofu cubes lightly with cooking spray and season with salt and pepper. Bake tofu for 30-35 minutes, or until lightly golden. Combine ketchup, sugar, fish sauce, and Sriracha; set aside. Result: We really enjoyed this! It certainly wasn’t “traditional” but I appreciated the simplicity and sweeter flavor. Like I mentioned before, if you’re a newcomer to pad thai, I think this would be the perfect first taste. Enjoy! Weigh-in last night went as expected — +0.4 lbs. 🙁 I deserve it. There was a few too many of these (there’s only 4 left and Mr. P can account for none of them…oops) and over the duration of the weekend I enjoyed a nice bottle of 2003 Banfi Chianti that may or may not have been accounted for calorically. Imagine that! On a completely unrelated note, Mr. Prevention asked me to be his wife 4 years ago today. Aww 🙂 We had a long, 2 year and 2 month engagement while he finished his expat assignment in Italy, and our 2nd wedding anniversary is coming up in May. It’s hard to believe how quickly time passes by! Love you, babe. Question: Have you had pad thai? And do you celebrate fun “anniversaries” in time, too? Gettin’ closer to the weekend!! « High Fiber Haystack Cookies + a garden update! I LOVE Pad Thai (and Drunken Noodles) so I NEED to make this! This recipe looks OUTSTANDING!! I haven’t had pad thai in so long, and of course I’ve never made it myself… I’m impressed. Nick and I celebrate random anniversaries too (not that an engagement is random…) It.s an excuse to be extra romantic and good to one another! Congrats to both of you!! Ooooh, I love this recipe!!! Yum! Happy engagement anniversary!!! Do you know that I don’t remember the date of when Ryan proposed? Yikes!! I have such a bad memory! I love Pad Thai but have never made it myself. Your version looks and sounds good! I love pad thai also but it’s really hard to find a really good version. And once you have a a really good version…you can’t go back. I am big fan of Thai foods..and this truly looks and sounds awesome..can you pass me that plate please..looks so yumm! Oops, forgot to wish you..Happy engagement anniversay dear! I need to renew my Cooking Light!! 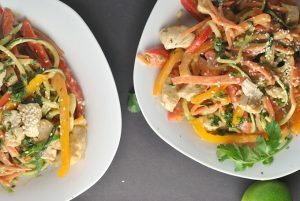 This looks delicious – and I like that you baked yoru tofu too – although I have been known to toss my tofu into corn starch and fry it in my wok with a tsp. of peanut oil – it gets crispy on the outside, and fluffy on the inside – yum! p.s. I buy my 00 flour on the Italian aisle of our ethnic grocery store, but it might be sold with the Bob’s Red Mill flours? No one ever wants to see a gain in a weigh in. It’s disheartening. But I think you know that .4lbs is barely anything. I bet you sweat more that .4lbs during hockey. Congrats on the engagement anniversary – I would totally celebrate something like that. 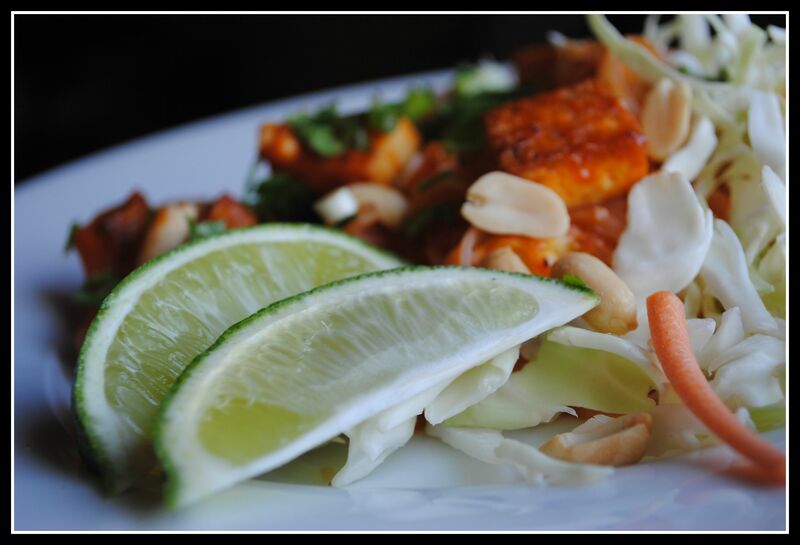 no, I have never had pad thai…I want to order it…but then I go back to this wonderful curry dish at the local Thai restaurant I frequent! Awe…congrats to you on your anniversaries. The years go by so fast. It will be 20 years for my hubby and I this June. 20 years? I can’t believe it. I have never had Pad Thai but my friend adores it! DEfinitely passing along this recipe to her ! I love Pad Thai! The ketchup thing would throw me off a little bit too but I’m willing to give it a shot! Yummy! LOVE pad thai. I haven’t had it in ages because it’s so hard to find gluten-free and I’m just too lazy to make my own. But now I really want to. what a great idea- this looks so good! 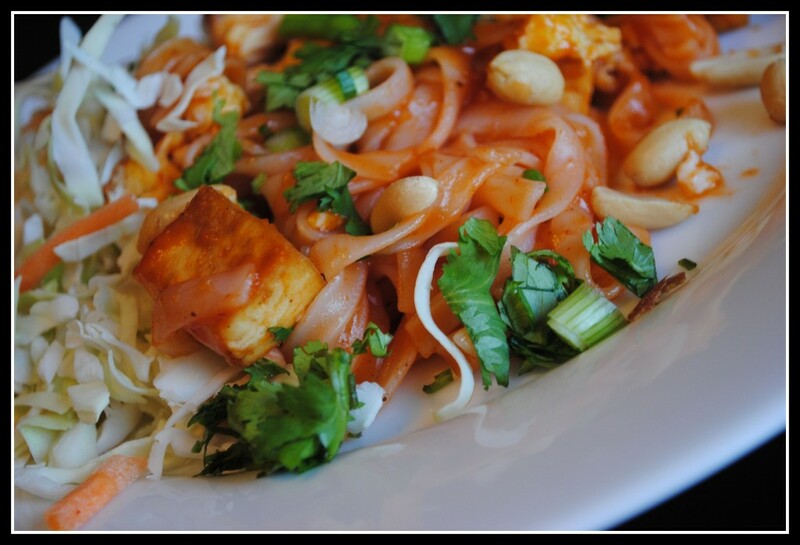 Pad thai is a favorite here too! I would love to come up with a version that didn’t require portion control 😉 Wishful thinking! Happy engage-iversary!!! We celebrate random days too. Thanks for yet another stellar looking recipe. I want thai food now!!! Have a great day. YUM! I love Pad Thai (and thai food in general).